One provision of the Morrill Act of 1862 was the ability to lease and sell federally held land – 30,000 acres per congressman – to build an endowment to support land grant universities. Iowa was the first state to accept the provisions of the Morrill Act and Iowa Governor Kirkwood wasted no time appointing Peter Melendy to select the very best 210,000 acres of Iowa land to fund the land-grant college. Iowa is the first state to digitally map all land grant parcels within the state. 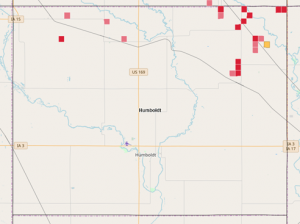 Melendy selected land in 27 north central and northwestern Iowa counties – two-thirds within current day Kossuth, Emmet, and Palo Alto counties. Other states were given “scrip” when federal land was not available within their borders; the scrip allowed available federal land in other states to be claimed. Twenty-five states were granted land in northwestern Iowa for this purpose. Explore the maps to locate land grant parcels; change map background or add layers of historical data for additional detail; share via social media or print the map.